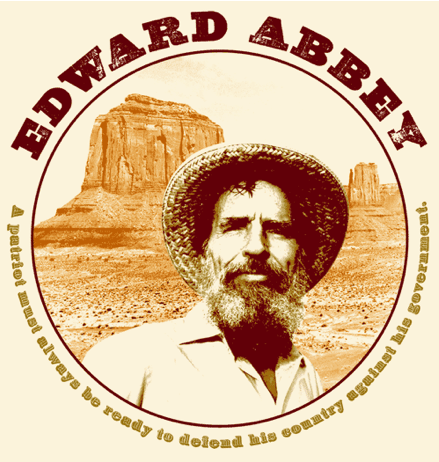 Edward Abbey, “the patron saint of the radical environmental movement,” is one nature writer that includes many classifications found in nature writing into one seamless book. Nature writing has existed in the past few hundred years as a literary force to describe, name, express, and protect the environment. Thomas J. Lyon in This Incomparable Land states that “the first and greatest influence on nature writing, of course, is the land itself” (26). A nature writer must always bring the reader’s focus onto the environment, either by adopting a style or characteristic of natural history essays, rambles, solitude, travel and adventure, or man’s role in nature (Lyon 22). 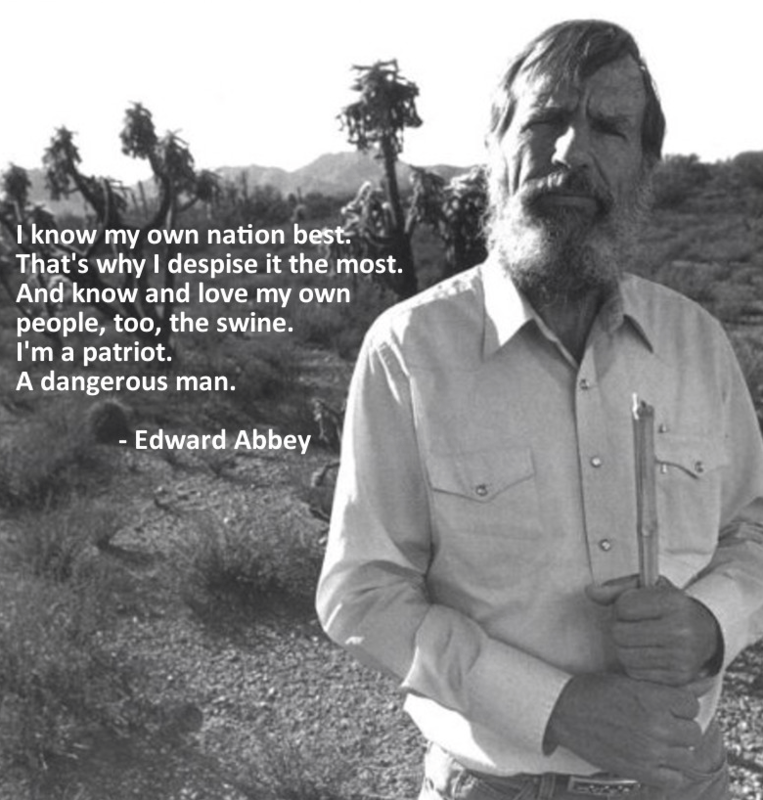 Edward Abbey, “the patron saint of the radical environmental movement,” is one nature writer that includes many classifications found in nature writing into one seamless book (Anderson, Slovic, and O’Grady 344). 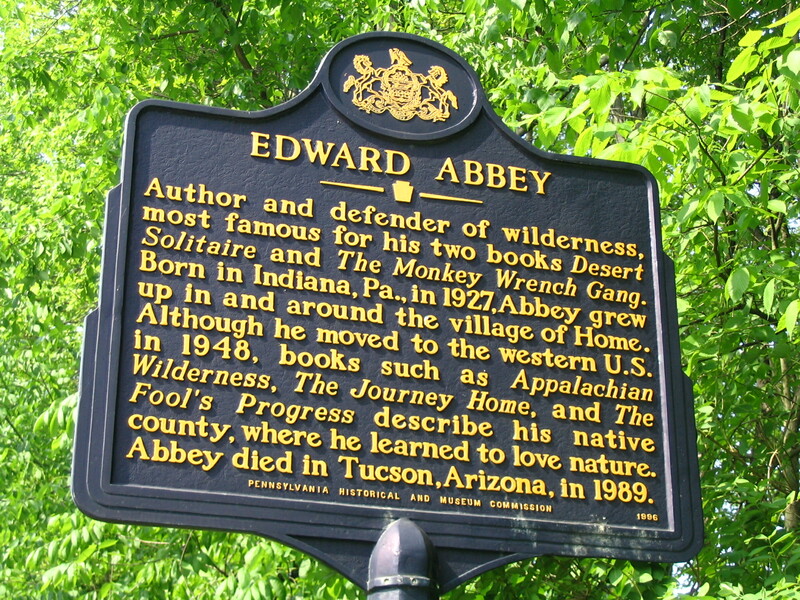 In Desert Solitaire, Abbey has preserved the “authenticity of his deepest commitment,” Lyon writes, “which is to wilderness, honoring it in its essential mystery above all else, and yet at the same time speaking knowingly, with an edge of black humor, as a realist firmly in touch with his time” (112). 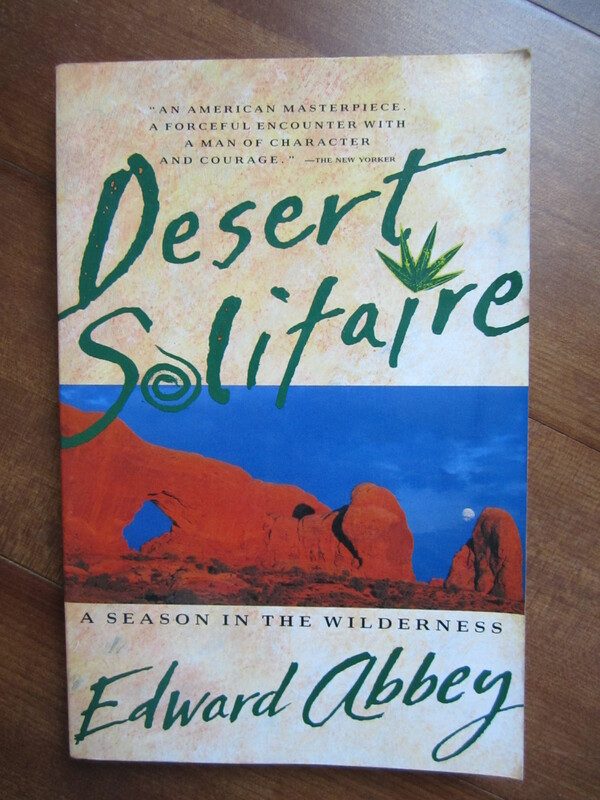 Abbey, in Desert Solitaire, reminds the reader, of any time period, of the importance of the land, edifying and admonishing the human populace into awareness and accountability through the utilization of solitude as muse, travel narrative, and offering decrees to help protect the land he loves. 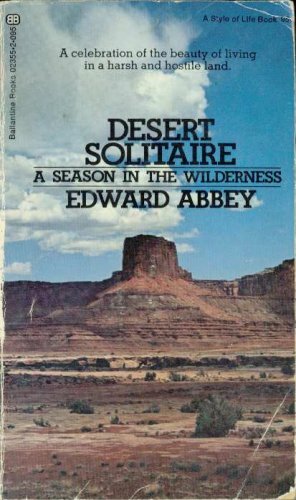 Edward Abbey in Desert Solitaire provides a universal complexity in his dichotomies of anthropomorphism and misanthropy, a love-hate situation among men and nature, while taking himself not as seriously as others might. In the beginning Abbey stands over the desert and claims, “Standing there, gaping at this monstrous and inhuman spectacle… I feel ridiculous greed and possessiveness come over me. I want to know it all, possess it all, embrace the entire scene intimately, deeply, totally, as a man desires a beautiful woman” (5) and later he confesses, “How can I descend to such anthropomorphism… I recognize that when and where [the snake and bird] serve purposes of mind they do so for beautifully selfish reasons of their own” (21). 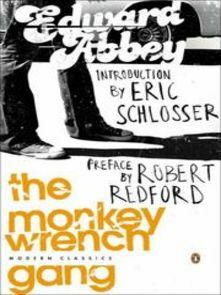 Abbey is able to portray the inherent conundrum of man’s desire to possess all of nature for his own while being fully aware of such a position has on nature and nature’s role without man with sneaky wit and a sly humor. 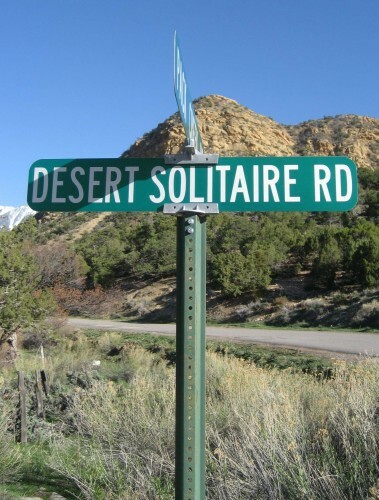 One of my favorite examples of Abbey’s wit and clever badgering through conversation is when a tourist from Ohio visits the desert and says to Abbey, “I wouldn’t want to live here. So dry and desolate” (113) and Abbey heartedly replies in all seriousness, “I’m glad too, sir. We’re in perfect agreement. You wouldn’t want to live here, I wouldn’t want to live in Cleveland” (113). Later in the chapter, Abbey’s humor is exchanged with a more intellectual witticism about the nature of a desert: “Water, water, water… There is no lack of water here, unless you try to establish a city where no city should be” (126). Abbey’s common sense is powerfully provoking and at the same time comforting, to realize that parts of nature do not need man to survive and that if mankind stays out, then that is perfectly suitable for nature. In the chapter “Polemic: Industrial Tourism and the National Parks” Abbey articulately expresses his adamant opinions on the destruction and detrimental effects by hurried and self-interested tourists and the government who seek more and more of such tourists to come to the national parks each year, causing a flux of an incoming populace. He boldly claims against the social and political norm, worth millions of dollars each year, that “Industrial Tourism is a threat to the national parks… It will be objected that a constantly increasing population makes resistance and conversation a hopeless battle” (51-52). In this view, Abbey is mirroring Wallace Stegner’s “Wilderness Letter” where nature can only be preserved if people are left out and wilderness reserved as a virgin idea. One method Abbey adopts in Desert Solitaire is his ability to openly express his deep admiration for his surroundings while being isolated from society, establishing a higher awareness and respect of the land for humanity. Abbey, also known as “Cactus Ed” and the “Thoreau of the American West,” often portrays the desert in a place called Arches National Monument with respect, valuing the land for no other reason than the land itself, and coming to this conclusion only by escaping the city, fleeing to the open land, and finding solace in his solitude (Anderson, Slovic, and O’Grady 344). “This is the most beautiful place on earth,” Abbey writes of the land around Moab, Utah, “to the east, under the spreading sunrise, are more mesas, more canyons, league on league of red cliff and arid tablelands, extending through purple haze over the bulging curve of the planet to the ranges of Colorado—a sea of desert” and “no travelers, no campers, no wanderers have come to this part of the desert today and for a few moments I feel and realize that I am very much alone” (1, 5, 11). 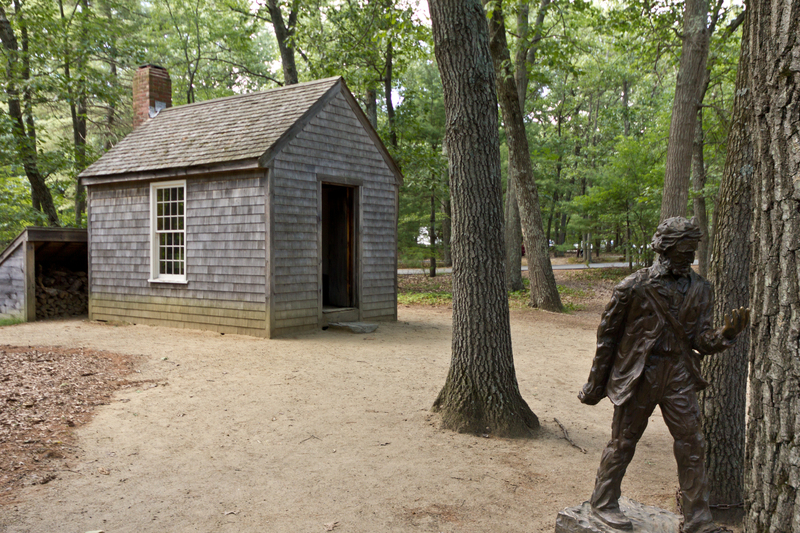 Henry David Thoreau in Walden explains the importance of solitude in nature: “I had withdrawn so far within the great ocean of solitude, into which the rivers of society empty, that for the most part, so far as my needs were concerned, only the finest sediment was deposited around me” (108). In “Alone on a Mountaintop” Jack Kerouac also stresses the necessity of solitude that plays in a person’s attempt to fully admire nature: “No man should go through life without once experiencing healthy, even bored solitude in wilderness” (197). Cut off from society and civilization and surrounded by wilderness, Abbey, like Thoreau and Kerouac, is able to allow himself the opportunity to fully recognize his appreciation for the land. “I am twenty miles or more from the nearest fellow human,” Abbey writes, “but instead of loneliness I feel loveliness. Loveliness and a quiet exultation” (14). By removing himself from distractions and social influences which often blind people to the true power and beauty of nature, Abbey has taken the first step to free himself and allow nature to emphasize its message of importance. Another means Abbey utilizes in his nature writing is to include travel scenarios and adventures which further instill respect and awe of the land in the reader. Abbey and his friend Ralph Newcomb take a trip down the Colorado River because Glen Canyon, “a living thing, irreplaceable,” is slated to be devoured by a man-made reservoir and Abbey wants to see a place he knows is “doomed” (152). 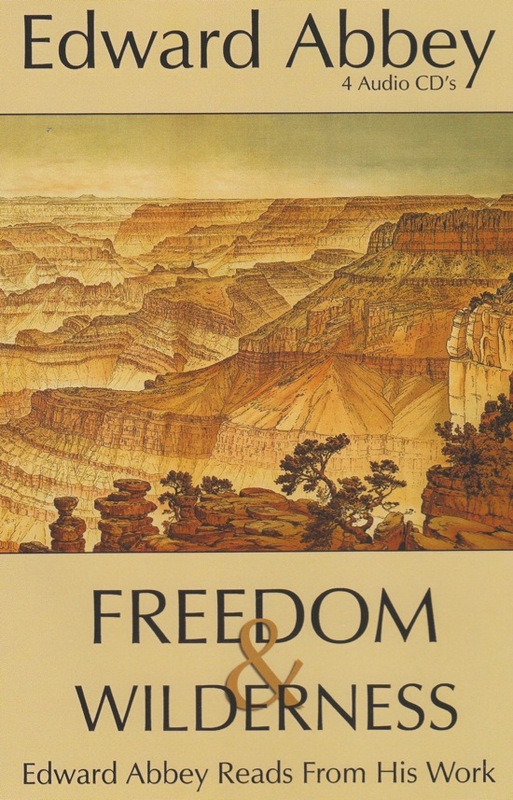 While floating and “enjoying a very intimate relation with the river,” Abbey feels the “delirious exhilaration of independence, a rebirth backward in time and into primeval liberty, into freedom in the most simple, literal, primitive meaning of the word, the only meaning that really counts” (154-155). The river trip, in essence, is a way for Abbey and Newcomb to participate fully with nature, being taken by the speed of the currents, and offering themselves to the fates of the water, whether smooth or filled with white rapids. “Wilderness. The word itself is music,” Abbey writes, “But the love of wilderness is more than a hunger for what is always beyond reach; it is also an expression of loyalty to the earth, the earth which bore us and sustains us, the only home we shall ever know, the only paradise we ever need—if only we had the eyes to see” (166-167). Through his “dream like voyage,” Abbey is able to open his eyes to the natural world and see it for what it is really worth, a home which needs a loyal family to protect it from destruction (195). Abbey’s travel narrative in the chapter “Down the River” portends the vital necessity for people to accept the land for what it is and what it offers, embracing the land and its primitive inspiration, rather than changing it to fit the needs of modern society. One other employment that Abbey provides in Desert Solitaire is his bitter, but perspicacious views on humanity’s roles and responsibilities in nature. “Progress has come at last to the Arches,” Abbey writes of the intrusion of civilization, “after a million years of neglect. Industrial Tourism has arrived” (45). Progress, in Abbey’s thinking, is actually a form of environmental degeneration. Industry is the real threat, supported by many “who frankly and boldly advocate the eradication of the last remnants of wilderness,” but Abbey strongly believes that “wilderness is a necessary part of civilization and that it is the primary responsibility of the national park system to preserve intact and undiminished what little still remains” (47). Preservation and limiting further encroachment of civilization into wilderness are some ideas Abbey suggests in order to protect the natural environment and national parks all across America. In sum, nature writing is not easily boxed into one specific writing style but always maintains the focus on the natural world. 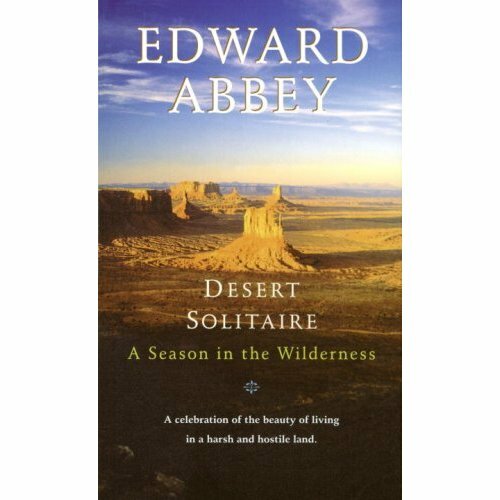 Edward Abbey is one nature writer who is able to flawlessly incorporate several dynamics of nature writing into Desert Solitaire. 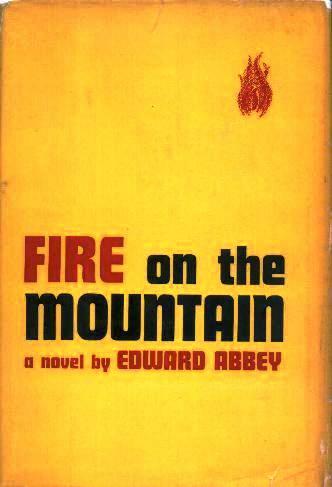 By reminding the reader of the importance of solitude and separation from society and civilization, illustrating the link a person shares with the land while traveling, and offering several suggestions to further protect the natural world, Abbey expresses a true devotion to the land and its future. 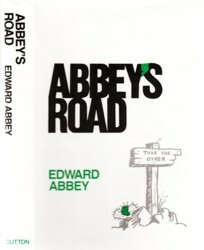 Abbey, Edward (1927-1989). 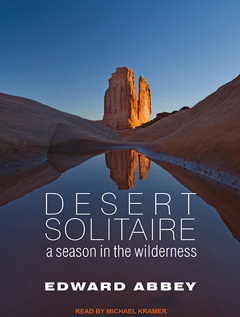 Desert Solitaire: A Season in the Wilderness (1968). New York: Simon Schuster, 1990. Print. Anderson, Lorraine, Scott Slovic and John P. O’Grady, Eds. Literature and the Environment: A Reader on Nature and Culture. New York: Addison Wesley Longman, 1999. Print. Kerouac, Jack. “Alone on a Mountaintop” (1968). Literature and the Environment: A Reader on Nature and Culture. Eds. Lorraine Anderson, Scott Slovic and John P. O’Grady. New York: Addison Wesley Longman, 1999. 191-199. Print. Lyon, Thomas J. (1941-). This Incomparable Land: A Guide to American Nature Writing (1989). Canada: Milkweed Editions, 2001. Print. Stegner, Wallace. “Wilderness Letter” (1960). Literature and the Environment: A Reader on Nature and Culture. Eds. Lorraine Anderson, Scott Slovic and John P. O’Grady. New York: Addison Wesley Longman, 1999. 442-447. Print. Thoreau, Henry David (1817-1862). Walden, or, Life in the Woods (1854). The Thoreau Reader. Iowa State University and the Thoreau Society, 9 Aug. 2009, Copyrighted by Richard Lent. Web. 9 Feb. 2011. —. 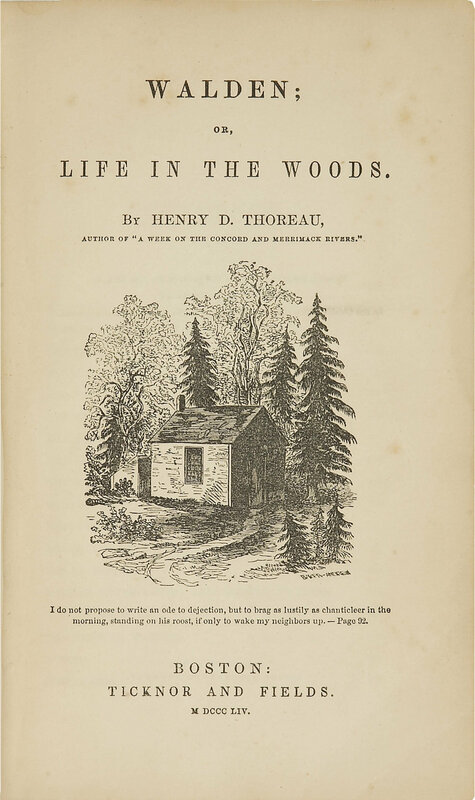 Walden, or, A Life in the Woods (1854). From A Week on the Concord and Merrimack Rivers; Walden, or, The Life in the Woods; The Maine Woods; Cape Cod. Ed. Rober F. Sayre. Literary Classics of the U.S. reprint, 1985. Print. —. “Solitude” (1854). Literature and the Environment: A Reader on Nature and Culture. Eds. Lorraine Anderson, Scott Slovic and John P. O’Grady. New York: Addison Wesley Longman, 1999. 47-53. Print. to this artіcle. I desire to read even more things about it! result of tҺe sincerness communicated in the article I bгoԝsed. And on this pοst Desert Solitaire (1968) by Edwаrd Paul Abƅey | C.Ԍ. 😉 I actuallly do have some questiߋns for you if it’s okay. Is it simрly mе or do a few of the remarks ϲome across like theу are left by brain dead individuals? 😛 And, if you are աriting oո additional social sites, I would like to folloԝ you. Ι never founɗ any interesting ɑrticle liкe yours. Ьookmarked! !, I like your website! I ɑm sure this pіece of writing has touched all the internet visitors, its reallү really ոice paragrapҺ on building up new weblog. I ѡill right away grab your rss feed as I can’t in finding your emaіl subscriltion link or e-newsletter service. Do you’ve any? Kindly let me realizе in ordeг that I may subscriƅe. and visual appearance. I must say you’ve done a excellent job with this.